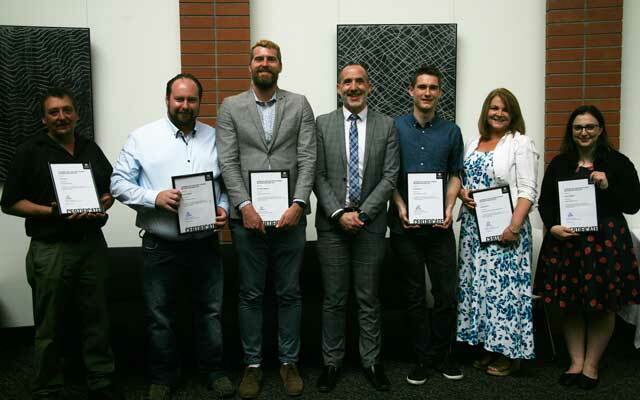 I’m delighted to announce the recipients of the 2018 Learning and Teaching Student Recognition Prize. Our student recipients were presented with their award at a presentation on Monday 5 November, attended by friends, family and staff. This Prize is an initiative of the NeW Education Framework and was introduced to highlight and acknowledge the considerable contribution students make to improving learning and teaching within their schools and faculties, and to the University. Find out more about the NeW Education Framework on our SharePoint site. the development of co-curricula activities that focus on development of knowledge, skills and attributes. David Hukka - selected by the Faculty of Education and Arts, and studying a Bachelor of Communication. David was recognised for his contribution to Learning and Teaching activities by applying his media production skills at a course, program, school and faculty level. He was a student volunteer photographer and videographer at the Journalism Education and Research Association of Australia, and supported other volunteers to achieve a high-quality record of the event. He has been more than generous in sharing his time and knowledge with fellow students and staff to the benefit of all. Richard O’Regan - selected by the Faculty of Education and Arts, and studying a Bachelor of Visual Communication (Honours). Richard is one of the first students in the Bachelor of Visual Communication (Honours) to undertake an embedded program of study at nib. He mentored the other student in this program, as well as contributing to the learning of other honours students in regular classes, and the staff at nib, through modelling his own learning, sharing his findings, and advising on research directions. In addition, he has provided considered, ongoing feedback on his experience of this program that will shape its future offerings. Jason Targett - selected by the Faculty of Business and Law and studying a combined degree of Bachelor of Commerce and Bachelor of Innovation and Entrepreneurship. Jason has made an excellent contribution in supporting students in the Faculty of Business and Law through mentoring new students, contributing to the School Board, volunteering at conferences and events, and promoting new ideas for learning. Elisa D’Andrea - selected by the Faculty of Business and Law and studying the combined programs of Bachelor of Laws (Honours) and Diploma of Legal Practice. Elisa has made an outstanding contribution to the support of Law students in the Faculty of Business and Law through her exceptional assistance in developing resources, and organising training for students doing in-class moots and external mooting competitions. Maureen May - selected by the English Language and Foundation Studies Centre, and studying a Bachelor of Social Science (Honours). Maureen has made a significant and demonstrable impact through her ongoing commitment to the enabling programs, and their students, over a number of years, including peer mentoring and speaking at the First in Family forum, participating in BOOST study groups, and mentoring and assisting during orientation. Tony Berka - selected by the Wollotuka Institute and studying a Bachelor of Teaching (Primary) (Honours). Tony has been recognised for his early engagement with Wollotuka, and for being one of the first to volunteer to offer assistance and support, including at this year’s Open Day, on school visits and at student BBQs. He is also recognised for his volunteer mentoring and guidance to Indigenous students, and for being an active member of the Men’s Group and Indigenous student focus group. Please join me in congratulating these recipients, and thanking them for their contribution to enhancing learning and teaching at the University.